I did my first paid speaking gig over the weekend. Only one person fell asleep, so I considered it a success. 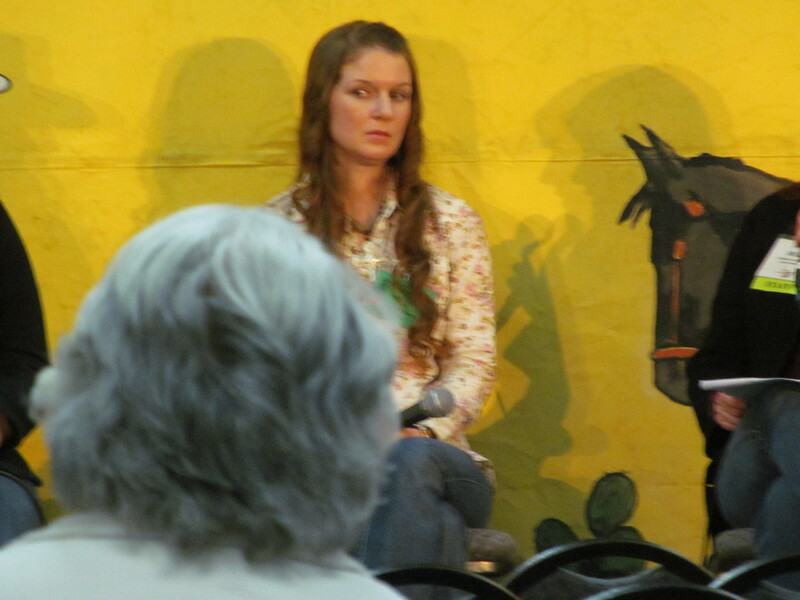 I was on a panel for a discussion called Being Cowboy in a Digital World at the National Cowboy Poetry Gathering in Elko, along with Jessica Hedges of Oregon and Jessie Veeder of North Dakota. 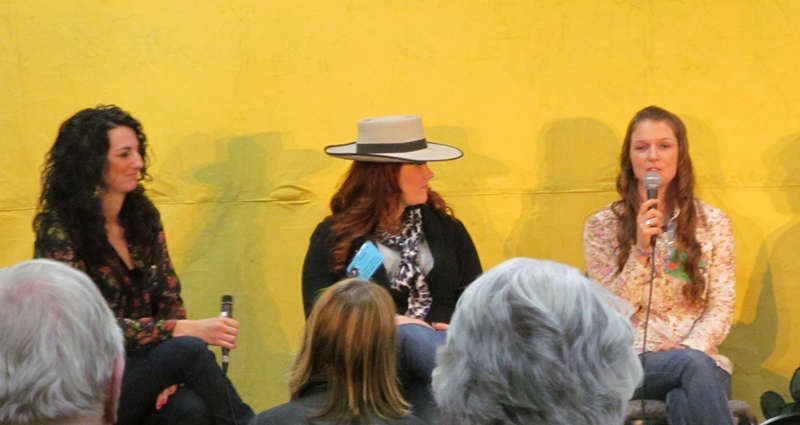 Besides the basic requirement of having J names, we three were chosen as panelists because we live on cattle ranches and use blogs and social media to communicate about the ranching way of life. Jessica is a cowboy poet and Jessie is a singer/songwriter, so they’re used to being on a stage and talking into a microphone and having strangers look at them for extended periods of time. I felt slightly out of place; I’m a writer because I like to write, think, delete, write, ponder, cut, paste, close a document, wash the dishes, open the document, reread, rewrite, etc. until the finished product is presented to the public in printed form with me nowhere in sight. I’m used to being a name on a page, not a face on a stage. After our gracious moderator, Amy Mills, introduced each of us, she (naturally) expected us to talk. Into a live microphone. While the rest of the room was completely quiet (well, except for my baby’s random squeals from the back row). Furthermore, we had to speak one at a time, so every pair of ears (except for Nappy Napperton’s) were focused solely on the speaker’s words. The first time I had to speak into that resonating microphone, my mind went completely blank. Every funny quip of my husband’s that I’d planned to steal and pass off as my own disappeared. I couldn’t remember my child’s name, much less Amy’s discussion prompt. I thought, What would happen if I just completely choked and couldn’t say anything? That’s a thing, right? Isn’t that a thing? That’s called stage fright. Wait, I’m not acting in A Charlie Brown Christmas, circa fourth grade. Grown-ups don’t get stage fright. I think I’m getting stage fright. Oh my gosh, it’s my turn to talk. Everyone but me has talked. They’re obviously going to expect me to talk. Am I breathing evenly? Do my shoulders look too rigid? I don’t exactly look comfortable on stage, do I? That’s because I wasn’t. Hey, look! I’m talking and the people next to me are smiling. That’s a positive sign. Once the discussion got rolling, I didn’t have to remind myself to breathe. I looked at the other two panelists and noted that Jessica had a 10-week-old baby and my 13-month old still-nursing baby was running around the back of the room. There was only one dry on the panel. She should be okay, though – it wasn’t the fall works, and the Poetry people weren’t culling very deep. Mental asides like that are probably why I had trouble remembering Amy’s discussion prompts. “Stage fright” was just a cover-up. 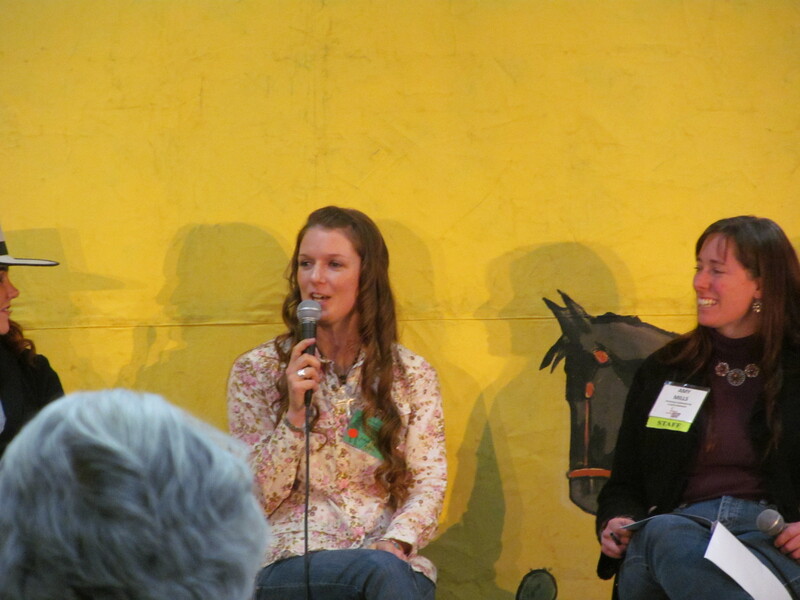 I had fun getting to know Jessie, Jessica and Amy through this panel. The digital world has allowed cowboys and their families to stay more connected to others, and that is healthy for people. People need other people. Like these three, they need each other. Or actually, maybe it was just me that needed them to be up there with me so I didn’t hyperventilate and say something dumb like “Hi, Peggy!” and wave when a family friend walked into the room. Oh, wait, I totally did that. Yes, I’m that dorky. Look for the Nevada Rancher magazine on Facebook and call 866-655-5011 to subscribe. We’d love to have you as a reader! You did fabulous!!! It was such an honor to share the stage with you and I definitely think you should consider doing more of this sort of thing 🙂 Can’t wait until next time! Thanks Jessica! You and Jessie did great, too. It was nice having you two seasoned pros up there. See you soon probably! I loved that you said hi to your friend, actually. Yeah, sometimes you have to find a real moment for yourself onstage, and actually, that helps other people connect with you. I totally relate to stage-fright, as my usual role is to get other people onstage and smile at them from the wings. You did great. And more to the point, you had good things to say and a perspective people were interested to hear. Great to get to know you! Thanks Amy, it was great to get to know you as well! I’m so glad you were there to be all calm and professional and hold it all together. While the other two ladies were speaking, I was seriously thinking, What if I just stepped off the stage and apologized for not being able to do this? Glad I made it through, though, it was a really fun experience.